An Unusual Warning From Goldman Sachs: "Market Depth Has Collapsed"
With Morgan Stanley becoming the latest to join the growing lament over the market's ever declining liquidity, noting that "It's Not Your Imagination, Large Moves Are Becoming More Common In The Market" an appropriate question that has emerged is just how does one define, and measure, liquidity? Liquidity is both hard to define and hard to monitor. Volumes, bid/ask widths, and ease of execution can all be metrics of liquidity. A key (unmeasurable) metric is the ease of executing a large trade - for example, what would the market impact of selling $1bln of SPX futures be? Of utmost importance to hedgers and volatility traders is an even more unmeasurable number: what would the market impact of a large order be if markets are already down several percent in a day? It is hard not to see the material deterioration in top-of-book depth as having negative implications for this last metric of liquidity as well. Liquidity is unmeasurable: when defined as the ease (or cost) of executing a large trade, the only true way to measure liquidity is to actually trade large amounts, but that act would in itself alter liquidity conditions (liquidity’s Heisenberg uncertainty principle?). Barring a true measurement of liquidity, there are various metrics we watch to monitor liquidity. Volume is one: markets exhibiting high volume are generally more liquid than those exhibiting low volume. However, volume can be misleading in times of market stress, because a rush to re-align portfolios may push up volume even with high trading costs. Expanding on his "uncertainty principle" of observation vs interference, Fishman then notes that "while we are only observers of market microstructure, we believe market bid/ask depth is a meaningful indicator of liquidity." This is important because even if investors do not need to instantaneously execute large trades with zero market impact, "if execution algorithms are sequentially trading listed depth a smaller bid/ask depth will increase their execution costs." To further monitor, if not measure, liquidity, Fishman examined 7 years of intraday data, focusing on E-mini SPX futures, and analyzed the quotes posted electronically. The bid/ask depth, or number of contracts/shares associated with those quotes, is lower at the median moment now than it was throughout most of 2017. Which brings us to Fishman's focus on the market's top-of-book, or bid/ask depth. 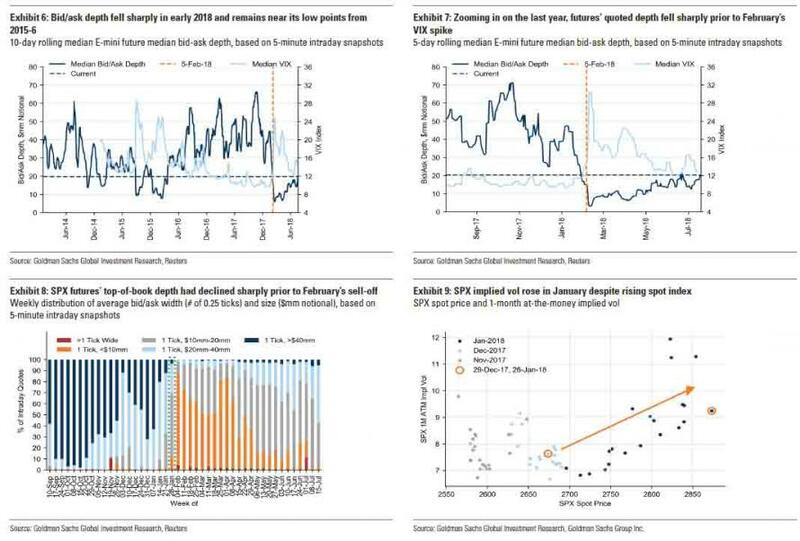 Here the Goldman strategist notes that February’s VIX spike was a key event and "while it’s easy to dismiss February as a one-off anomaly because the inverse VIX ETPs that were so important to its mechanics are much-diminished, evidence that US equity market depth conditions were weakened in the lead-up to February and remain weakened now points toward value in long volatility positions." Bid/ask depth had deteriorated prior to 5-Feb’s VIX spike. In the week prior to 5-Feb, bid/ask depth was roughly 50% of its typical size from early January or late 2017, and was smaller than the rise in volatility would have indicated it should be. The week of January 29 was the worst week for bid/ask depth in years for SPX futures and key US equity ETFs. Currently, E-mini SPX futures’ bid/ask depth is well below its range from 2H2016 and 2017, even though volatility has receded. For any given VIX range, bid/ask depth is lower this year than it was in 2016-7. We can also make the case that market depth was unusually strong in 2017 - perhaps contributing to the period’s historically low volatility. He summarizes his findings in 4 key charts. 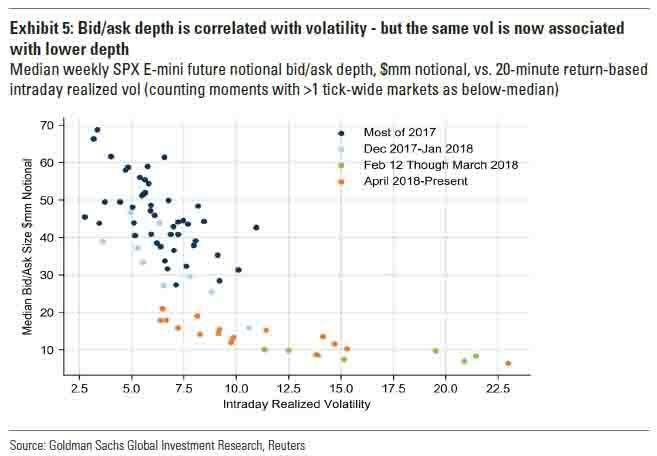 Looking at a sensitivity of different market regimes in which market depth (measured in median bid/ask size) is mapped against intraday realized vol, Goldman notes that while bid/ask depth is correlated with volatility, the same vol is now associated with lower depth. In practical terms this means that while in late 2017 over $40mm notional was on each side of E-mini futures’ bid/ask at a median moment - or how much could be traded without impacting the market - recently the median range has been $10-20mm notional. Next, Fishman focuses on the February 2018 VIXtermination event, which was particularly notable in how rapidly liquidity disappeared from the market. 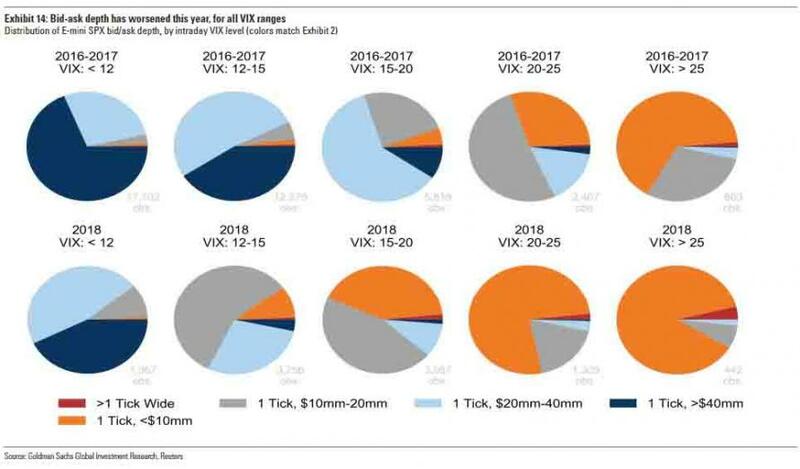 Here, the Goldman strategist writes that while in the weeks leading up to February’s VIX spike, investors were justifiably worried about growing risks from the VIX ETP market, however, he thinks there was more to the story than that: top-of-book equity market depth was deteriorating, across futures and ETFs, beyond what rising vol would be consistent with. Given the levered and inverse VIX ETP market size, an oversized reaction of VIX futures was to be expected should the SPX sell off aggressively in a late afternoon, but the ferocity of February 5’s mid-afternoon sell-off in the SPX itself is still difficult to interpret. If liquidity conditions were poor pre-event, one or more sell orders that might normally have had little impact could have escalated into a larger event. 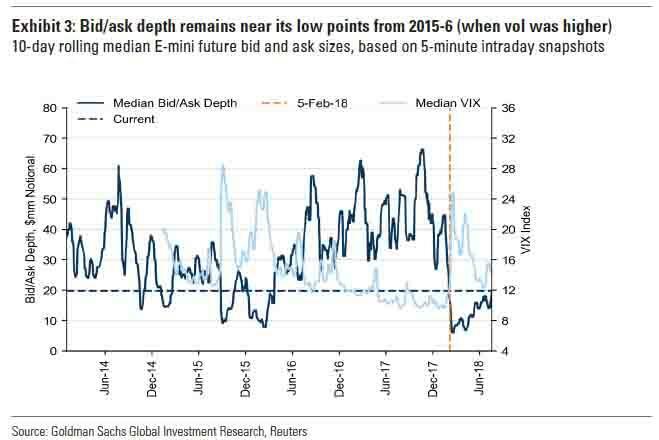 In other words, the broader market's shrinking liquidity, measured by the limited bid/ask depth "was likely a cause, not just an effect, of February’s volatility." 50% drop in bid/ask depth. 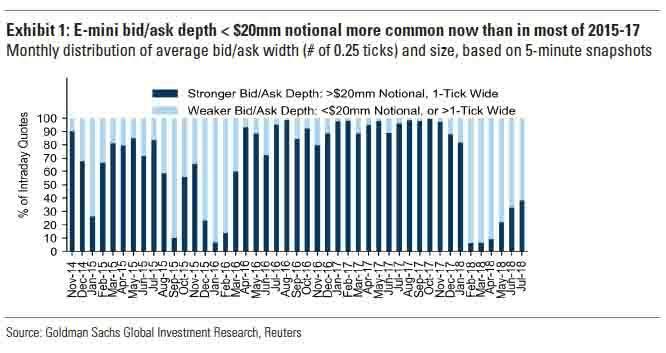 The median bid/ask depth in the three weeks leading up to February’s vol spike was roughlyhalf the bid/ask depth seen in early January or in Q4 2017. There’s no single moment when it changed. There does not appear to be a single day when bid/ask depth dropped suddenly; rather, the change happened over a few days in mid-January. Vol up, spot up. During the tax reform-led rally in January, implied volatility markets started to break their pattern of vol falling when markets rise, as implied volatility was rising despite a rising spot market. Complex macro surprise. The market’s focus on wage inflation in the early February jobs report could have constituted the type of complex macro surprise that often leads to HFTs prudently pulling back. Currently, bid/ask depth is worse than most of the last few years for E-mini SPX futures and many US ETFs. Depth metrics are improving, but this is still the case if we normalize for higher volatility than we had in most of 2017. The initial months following 5-Feb showed poor market depth. Bid/ask depth conditions have improved, in part because volatility has fallen. Currently, bid/ask depth is slightly better than it was in the volatile early part of 2016. Was 2017 the aberration? It’s possible that 2017’s extraordinary low volatility helped further very strong liquidity (perhaps the post-Brexit vote rally was a sign that conditions are safe for strong market-making). We wonder if 2017’s numbers are an unreasonable metric to compare current conditions to. Volumes are still strong. Bid/ask depth is just one metric of liquidity, and one that seems particularly connected with high-frequency traders. Normal volumes point toward decent base-case liquidity. There are other sources of liquidity beyond electronic markets, and these are likely strong. Low liquidity means high vulnerability to shocks. 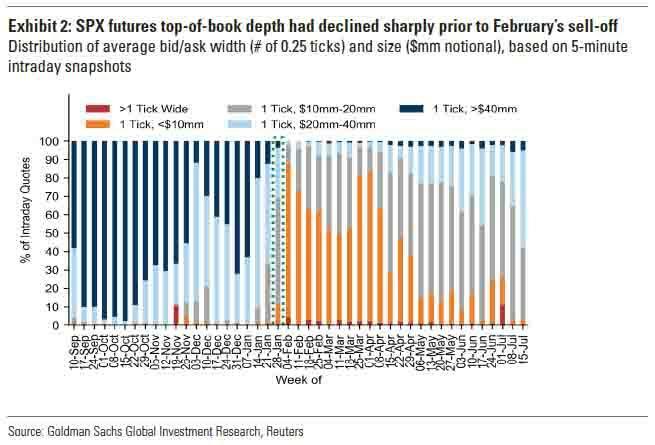 To the extent diminished top-of-book depth is indicative of potential weak liquidity in a sell-off scenario, we may continue to be vulnerable to severe market shocks. Heightened potential for liquidity to weaken in a sell-off ultimately contributes to volatility of volatility: when volatility rises sharply, weakening liquidity can make incremental trades move markets more, pushing up volatility further. An economic model of liquidity. From a logical perspective, liquidity has its own supply-demand dynamics. When demand (including systematic strategies’ need to trade) exceeds supply (market makers’ willingness to facilitate trades), the cost of liquidity (market impact of a given trade) will rise. Individual trades moving markets more than they once would have, or more than warranted by fundamentals, means higher volatility. Bid/ask depth is negatively correlated with volatility, but the vol-depth relationship has shifted. We have observed that measures of bid/ask depth are indeed correlated with volatility. We can also see from the graphs below that the level of market depth associated with a given level of volatility has fallen. What worries us most is the bottom-right pie chart in the exhibit below: what happens when volatility spikes, if market depth is already lower-than-usual? We are worried that in the next severe volatility spike, liquidity conditions will weaken dramatically, just at the time when demand for liquidity (from systematic flows) is starting to rise. One mitigating factor is that we have found that some managed volatility strategies have been less responsive to initial volatility spikes than in past events. As seen in February, we could continue to see occasional mismatches between products that demand near-instantaneous liquidity and markets that see diminished liquidity in moments of stress. Put options are cheaper than they were throughout most of the last few years, across equity indices. 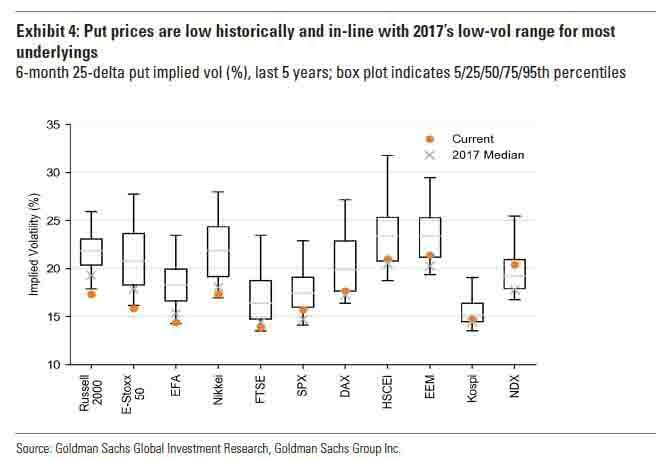 Hedge pricing is comparable to the low-volatility 2017 for many underlyings and strikes. Implied/realized volatility spreads are low or negative for most equity underlyings. This suggests that, for some reason, despite a structural, and growing flaw, in the market, traders are unable to appreciate the implications of the collapse in liquidity, and are significantly mispricing how much they charge for insurance. Another words for this is, of course, arbitrage. Weakened availability of liquidity when conditions are favorable could point toward especially low liquidity when it’s needed most – i.e. in the next severe market sell-off. The potential for markets to be vulnerable in a sell-off makes it even more prudent to take advantage of moments when volatility is back near historic lows. We believe that this trend further helps the case for hedging, which is furthered by slowing global growth and an ever-higher spot index level. Although our economists see low likelihood of a recession in the near future, it’s worth noting that the last few volatility spikes have happened in the middle of an economic expansion. reduced available trading size at a given moment potentially implies reduced liquidity in a severe sell-off scenario. February’s volatility seems to support that point. To the extent liquidity is the new leverage, if we start off our next sell-off with already-diminished equity market liquidity, how much liquidity will there be at the depths of a sell-off? Finally, some bad news from Goldman for the BTFDers: "Should the next crash happen closer to a recession, markets may be less likely to rebound quickly."